Are you looking for a Pre-Apprenticeship or new Apprenticeship? From School Leavers & those just starting out in the workforce - to Mature Age ladies that want to switch careers. How do you choose the right trade for you, where do you go to next, who do you contact, and are you looking for tips? We'll get information for you, or...let you know where you can get it. Anything we can do to make that first step easier for you. Here's what available rig﻿ht n﻿ow! 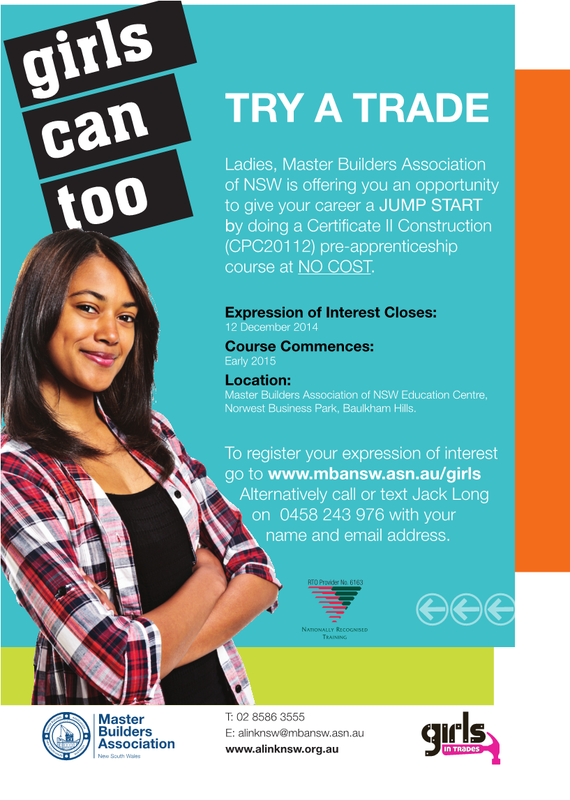 Here's your chance to “Try A Trade” with a FREE Pre-Apprenticeship Course through the Master Builders NSW. They are offering this to females genuinely interested in starting a career within the building trade. They require up to 12 candidates & Interested candidates can apply online. Courses often run for approximately 4 days a week for 16 weeks. Selected candidates will complete approximately 15 units of competencies.